Port exit dimensions: 1.04" x 2.03"
Estimated runner length - Shortest: 4.00"
Estimated runner length - Longest: 6.50"
Manifold height: (A) 4.13", (B) 5.21"
Stock/stamped steel valve covers may require 3/16" (or thicker) valve cover gaskets. We recommend: 720-168, 720-5867 or 375-1648 for adequate runner clearance. 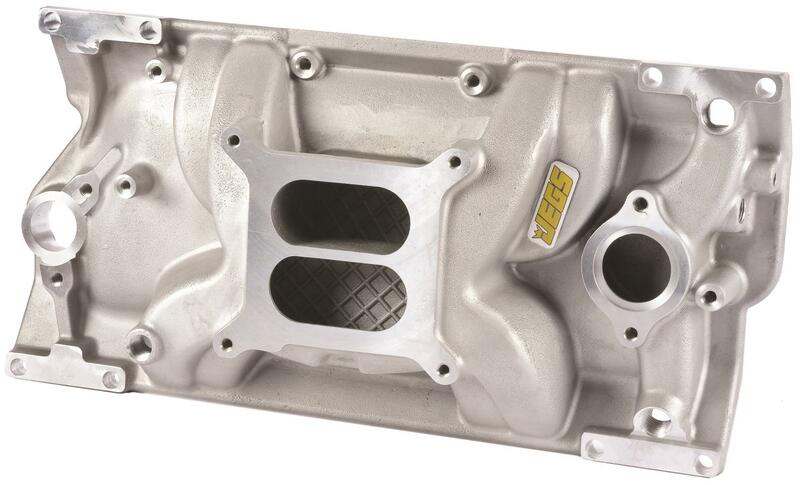 JEGS Champion Series 331 Dual Plane Aluminum Intake Manifolds feature the latest machining techniques to ensure the best quality and results. The process to make these cast aluminum performance intake manifolds yields a lighter, more consistent casting for smoother intake runners, optimal fuel atomization, and improved fuel & air distribution to the cylinders. What does all this mean? MORE POWER! Does JEGS 513002 fit your vehicle? 513002 is rated 4.7 out of 5 by 12. Rated 5 out of 5 by brat13085 from great looking intake this was a great buy, no fitment issues at all, fast shipping, definitely will be buy more from jegs. Rated 5 out of 5 by sad sack from performance products 513002 manifold bought this manifold to replace a castiron 2bbl on a boat. fit was great and increase in power is unbelievable with a 600 carb. i'd recommend it to anyone with more h/p in mind for a reasonably price. Rated 5 out of 5 by 79Camino2Mean from Great Great price and great quality. Will buy another for my next motor I build. Rated 5 out of 5 by BigJimmy from Great fit Item was just as described. Would recommend to the budget minded engine builder or just for an upgrade over stock. How tall is this manifold, from the bottom to the carb gasket surface? Two numbers are listed in the description for some reason. The manifold is slanted , front to back, that is why we show 2 different heights. i have a 1997 L30 305 vortec engine ,will this intake work on it or will the ports need opening up? thanks. This intake should work on your engine with little modification. What size pipe plugs do I need to plug the extra outlets on intake? This intake comes with the fitting to plug the vacuum port on the intake. The picture of this intake only show the center bolt holes on one side. is this accurate or is this a picture of a non working intake? I believe there are 6 bolt holes per side and this picture shows 4 on one side and 6 on the other. This intake uses 4 bolts on each side like the traditional Vortec pattern. These are found on 1996-2002 5.7 engines that are not LS based. I have a 79 camaro 350. I'm buying vortex heads will they fit? And what else will I need to install? Yes, this should fit your application, this is the correct intake. You will need a carburetor to complete the installation. Does it come with intake gaskets? Can this be used with a carburetor? This intake can be used with any carb or EFI unit with a 4150 flange. What thermostat do you recommend using with this intake?